We’d love your help. Let us know what’s wrong with this preview of Mapmaking with Children by David Sobel. The current crisis in geography education has spawned several new books on mapmaking, many of which advocate either recitation and drill or a conceptual top-down model that ignores children's interests. Mapmaking with Children presents an inspired alternative. 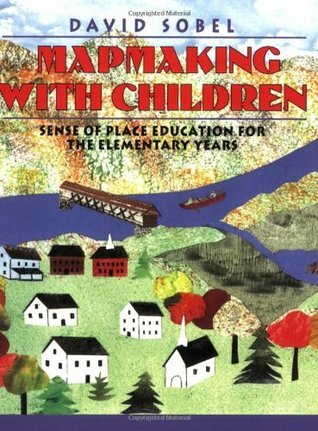 Maintaining that there is no substitute for hands-on experience, David Sobel places the initial emphasis on local The current crisis in geography education has spawned several new books on mapmaking, many of which advocate either recitation and drill or a conceptual top-down model that ignores children's interests. Mapmaking with Children presents an inspired alternative. Maintaining that there is no substitute for hands-on experience, David Sobel places the initial emphasis on local projects--projects that begin in students' own backyards and communities, projects that provide a sense of place. To ask other readers questions about Mapmaking with Children, please sign up. Place-based education is an “new-old” educational theory that proposes to invite children into project- based lessons that are meaningful precisely because they learn the various school subjects through investigating their local environment. Place-based education builds upon children’s familiarity with their immediate landscape and grows outward as the children grow in cognitive understanding for a holistic, global understanding of interconnected systems and topics. Map-making With Children is a Place-based education is an “new-old” educational theory that proposes to invite children into project- based lessons that are meaningful precisely because they learn the various school subjects through investigating their local environment. Place-based education builds upon children’s familiarity with their immediate landscape and grows outward as the children grow in cognitive understanding for a holistic, global understanding of interconnected systems and topics. Dreamy and useful. Lots of ideas both philosophical (developmental scales, skills, etc) and implementations (activities, worksheets, etc). This author has some great suggestions for mapping activities and projects. They sound like fun. Excellent explanation of why young children need to learn to make and read maps. Lots of creative project ideas for teaching mapping skills to children. Of particular interest to me were the chapters on the role of children's cognitive development in understanding different types of maps. A teacher's aid, for children over 5. Read the Whole Terrain interview of David Sobel about this book.